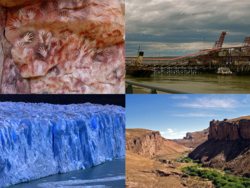 Clockwise from top: Cueva de las Manos, Harbour of Río Gallegos, Perito Moreno Glacier (Los Glaciares National Park), Río Pinturas. Santa Cruz is a province of Argentina. It is in the southern part of the country, in Patagonia. It borders Chile to the west and south. To the east is the Atlantic Ocean. It is the second largest province of the country (after Buenos Aires province). It has the fewest people in mainland Argentina. Perito Moreno National Park and Los Glaciares National Park are here. Río Turbio is Argentina's only active coal mine. There is also mining for gold, clay, gypsum, and salt. Sheep are also important for the economy. They are used both for wool and meat. This page was last changed on 25 November 2018, at 22:58.